Established in 1924, Loro Piana is one of the leading manufacturers of the finest and rarest textiles. The Italian company has evolved to become a renowned luxury fashion brand. Loro Piana men’s accessories showcase simple elegance coupled with plush fabrics. 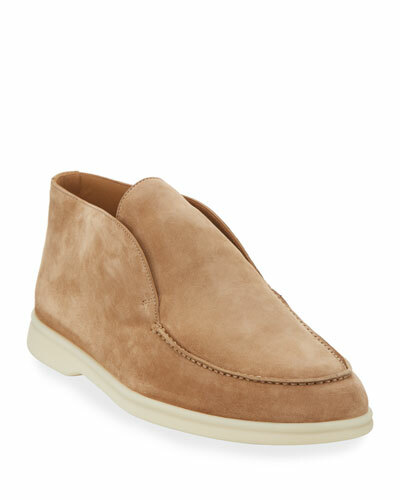 Neiman Marcus offers a fine assortment of Loro Piana scarves, leather gloves, cashmere beanies, baseball caps, fedoras, roadsters, and straw hats. Alexander McQueen silk scarf in allover skull pattern. Approx. 54.3" (138cm) square. Lightweight, seasonless fabric. Finished edges. May be styled multiple ways. Made in Italy. Model's measurements: Height 6'1"/185cm, waist 32"/81cm, typically wears size M.
Etro scarf in paisley pattern. Tassel at each corner keep scarf in place. Approx. 81"L x 26"W. May be styled multiple ways. Cashmere. Made in Italy. Model's measurements: Height 6'1"/185cm, waist 32"/81cm, typically wears size M.
Moncler "Sciarpa" scarf in chevron pattern. Ribbed cuffs; logo patch at end. Virgin wool/cashmere. Hand wash only. Made in Italy. Moncler "Sciarpa" scarf in chevron pattern. Ribbed cuffs; logo patch at end. Virgin wool/cashmere. Hand wash only. Made in Italy. 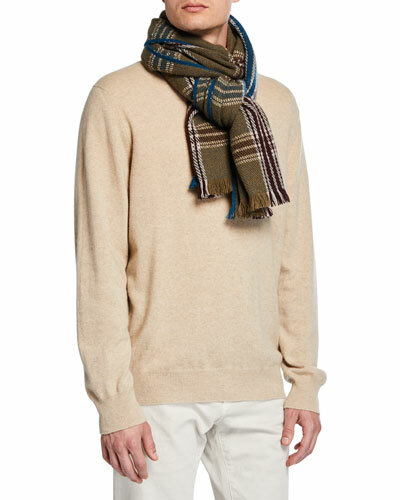 Model's measurements: Height 6'1"/185cm, waist 32"/81cm, typically wears size M.
Moncler scarf in three-striped knit. Approx. 62"L x 8"W. Fringed ends; logo patch at end. Virgin wool. Hand wash only. Moncler scarf in three-striped knit. Approx. 62"L x 8"W. Fringed ends; logo patch at end. Virgin wool. Hand wash only. Made in Italy. Model's measurements: Height 6'1"/185cm, waist 32"/81cm, typically wears size M.